I am one of those people who does food shopping on a per-meal basis. This means that every day I decide spur-of-the-moment what sort of meal I feel like preparing and go buy the necessary ingredients for just that meal. And then there may be some days when I really have no idea what I feel like making. Maybe I'll have some sort of clue or abstract craving but no real dish in mind. On those days, I'll know I'm in the mood for something; just not entirely what. Saturday was one of those days. Here is what I did: I wandered around my local health food store for 30 minutes until I happened to spot some vegan chorizo sausages made by Field Roast Grain Meat Co. I've been meaning to experiment with making my own vegan chorizo but for an extra-quick meal, those Field Roast sausages looked perfect. 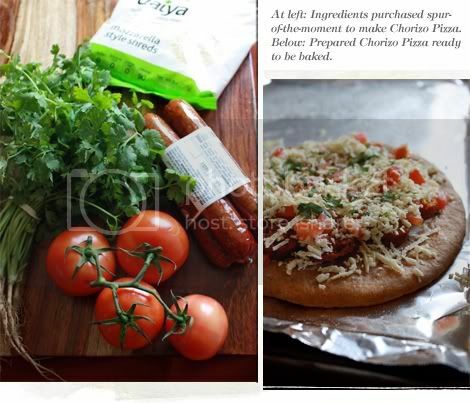 The sausages became the instant inspiration for 15 Minute Chorizo Flatbread Pizza —incredibly tasty and it only takes 15 minutes to make. But the best part? Flatbread pizza is an excellent candidate for making grilled pizza. Just drop the pocketless pitas on the grill at your Labor Day cookout, prepare the pizza and close the lid. Let it cook for 5 - 10 minutes until the Daiya has melted and the toppings are hot, checking to make sure the crust isn't burning. On a side note, I've used cilantro as a garnish in this recipe but I know that some can get pretty heated about their hatred for cilantro. If you can't stand even the thought of cilantro, you can instead top your pizza with fresh spinach before adding the Daiya and baking. Prepare the pizza: Preaheat the oven to 400°F. 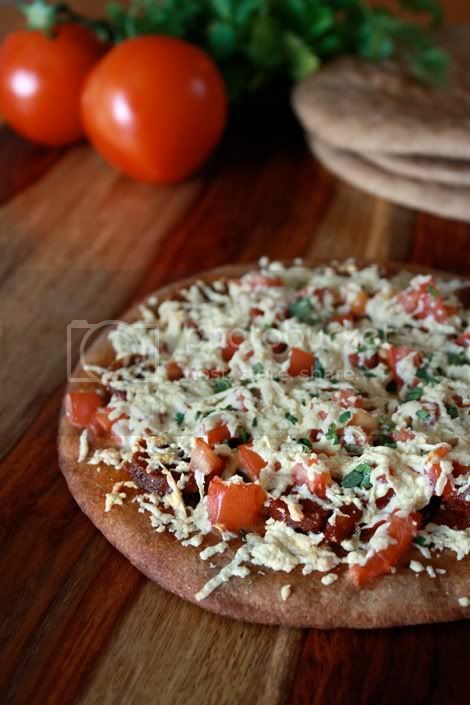 Place two pitas on a baking sheet that has been sprayed lightly with cooking spray — these will be your pizza crusts. Spread Earth Balance over each crust, stopping about an inch before reaching the edges. Place the chorizo coins onto the Earth balance spread (you can use as many as you'd like in whatever pattern you'd like; I used about 2 sausages worth on each of my pizzas places them in a circular pattern). Top the chorizo coins with Daiya and bake for 10-12 minutes. Remove from the oven. Sprinkle with salt and pepper to taste, and garnish with cilantro. Slice and serve. And that's it! The pizza was so simple and so incredibly tasty, I can't wait to make it again.